30% OFF! 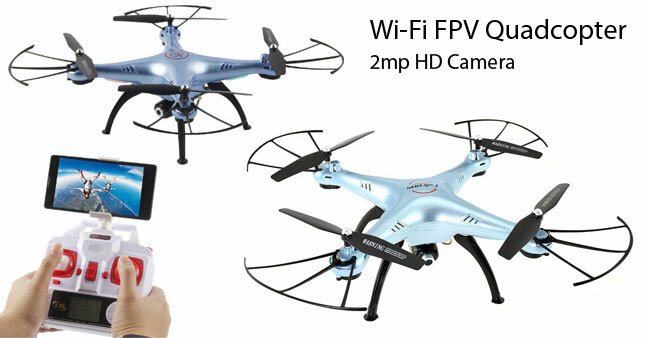 DM006 Falcons WIFI FPV Real time Camera Drone with Altitude hold function worth Rs. 19,500 for just Rs. 13,500! The new DM006 Falcons is a mid-sized First Person View (FPV) drone that transmits real-time video via Wi-Fi to your phone or tablet using an iPhone or Android app. Other improvements to the DM006 Falcons include a new transmitter which now comes with additional info displayed on an integrated LCD screen. Battery level, signal strength and speed rate are now shown. The presence of an additional air pressure sensor also referred to as a barometer, this will keep the drone at a preset altitude and it will keep that height constant regardless of yaw, speed and heading direction. A great feature that makes flying for beginners very easy. With a 3 speed controller and a 6 Axis Gyro providing Stable Hovering, Flips and Rolls in any direction as well as One Key Take Off the DM006 is an easy to fly quadcopter in a compact package chock full of features.